Enjoy breathtaking views of this iconic landmark. 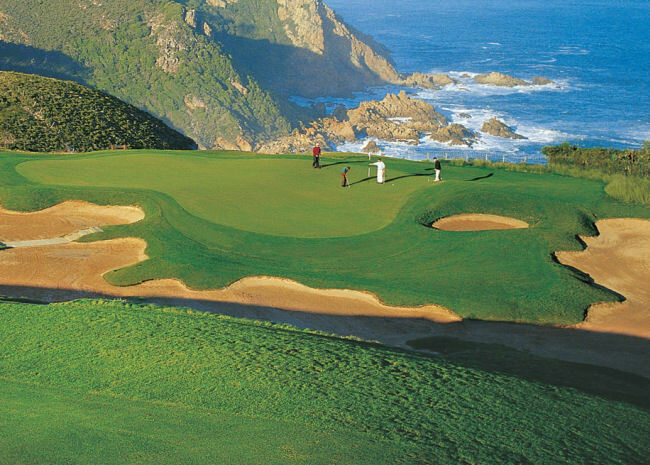 Cape Town and The Garden Route boast some of the most spectacular golf courses in Africa. A seaside location in a protected nature reserve. Spectacular views of Table Mountain compliment a truly challenging layout at the heart of a real estate development. A platinum golf course situated 10 minutes from Hermanus. One of the top golf courses in the Western Cape, the Arabella Golf Club stretches through rolling fairways, deceptive bunkers and challenging water traps. A charming and narrow course that meanders along a dune lined valley. Year round quality make this a sought after venue. Can be windy. Championship Golf Course, current home of the SA Open. Dramatic Scenery and world class golfing facilities, make this a MUST DO for all serious golfers. 021-8678000. South Africa’s only true links course provides a seaside scenic challenge. Majestic views of Table Mountain and sandy lies are the contrasting memories here. A championship layout on flat terrain. Tree lined fairways and clever water features make for memorable holes. Situated on one of the oldest farms in South Africa, Steenberg offers a magnificent 18-hole golf course with dramatic views of the surrounding Constantiaberg Mountains, and the vineyards of the Estate. Challenging water features, trees and wind make for some interesting golf on fast greens. Tall pines in the shadow of Silvermine Mountain compliment a popular layout. Very popular with the captains and the crew of British Airways when they have their down time in Cape Town, the scenery on this course will blow you away. 18 holes with lots of rolling hills, trees and bunkers to keep you focused. There are superb Golf Courses in the Garden Route part of the country. Other courses you should not miss are Pinnacle Point (Mossel Bay), Simola and Pezula, (both in Knysna).